Much of Holly Enowski's time in Africa was spent interacting with energetic children, such as this girl in Uganda. Photo courtesy of Holly Enowski. The world of Holly Enowski has always moved fast and on schedule. Before coming into her freshmen year at the University of Missouri this fall, Enowski engaged in several activities during her time as a student at Eldon (Missouri) High School and with other organizations such as the FFA. Photo courtesy of Holly Enowski. So it was no surprise that in April of this year Enowski traveled with her mother straight from the FFA state convention in Columbia to the DECA International Career Development Conference in Nashville. What was a shock, though, was the email she had received on her iPhone at approximately 9 a.m. one day while driving through Tennessee. Something exciting has come up that I’d like to talk to you about on the phone. The email was from Lisa Fleming, the director of global education programs at the World Food Prize. It was Fleming’s job to assist in placing the recently named recipients of the Borlaug-Ruan International Internship into locations all over the globe to work with scientists. She only had 24 hours to reserve her spot. Enowski had never traveled abroad before. She would be the first of her siblings (she is a triplet, but the only girl) to do so. She did not need that much time to reply. She then called her father to receive his blessing. “It was a very short turnaround, and I’m not a spontaneous person at all, but I was like ‘Sure I’ll go’ and I went with it,” she said. With that split decision, Enowski became the first incoming freshman at MU to take part in the prestigious all-expenses-paid internship program created in 1998 by Norman Borlaug and John Ruan. Borlaug is known as the famed “father of the Green Revolution” (and the founder of the World Food Prize), while Ruan is the former chair of the World Food Prize. 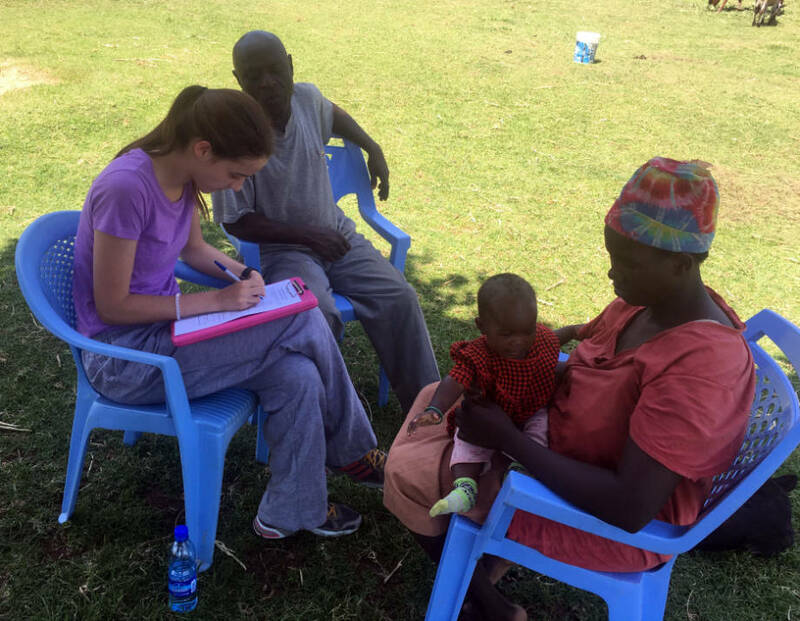 As part of her job, Holly Enowski interviewed push-pull farmers in Kenya and Uganda at their farms. Photo courtesy of Holly Enowski. Her busy schedule soon became even busier. She went to the World Food Prize headquarters the following week in Des Moines for orientation and to be debriefed about her summer assignment, which began in mid-June and ending in early August. She would be headed to the offices of the International Centre of Insect Physiology and Ecology (ICIPE) in Mbita, Kenya. She also met Isaac “Rico” Mirti, the other intern assigned to Kenya who is now a freshman at the University of Florida. She would go onto become friends with many of her fellow interns, stationed all over the globe, through regular Skype group chats on Saturday evenings, when they would compare and contrast their experiences. Enowski would delve into the topic of food safety by going out and talking with farmers (either through bits of English or interpreters) about their level of awareness at controlling aflatoxins, which have devastated Kenya’s cereal crop production over the years. These particular aflatoxins form in cereal crops, such as corn, as a result of several causes, including moisture, poor storage conditions or not harvesting the crops at the right time. They are not visible to farmers while looking in their fields, Enowski said, so many people unknowingly eat contaminated animal products or feed rotten crops, such as corn, to their livestock — resulting in sickness and even death. 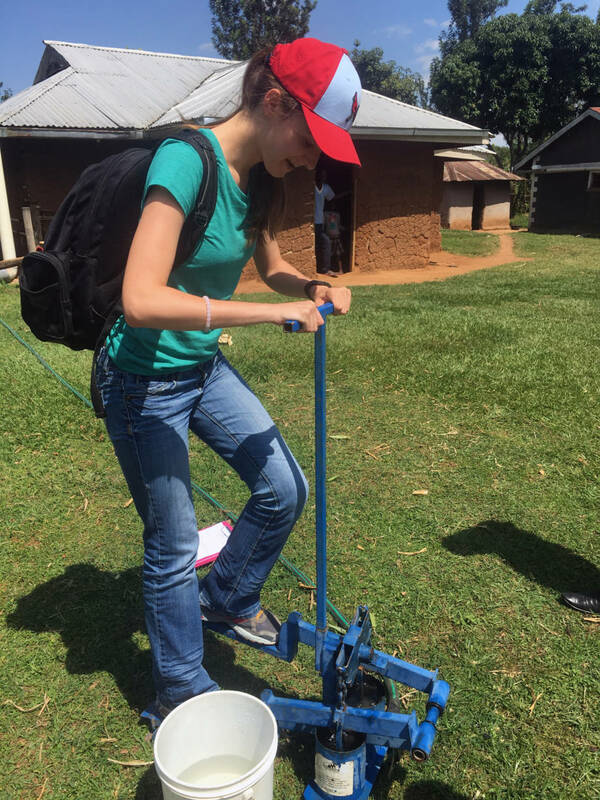 Holly Enowksi works with a device that helped pump water from ground that is maintained by push-pull … Expand ▸Holly Enowksi works with a device that helped pump water from ground that is maintained by push-pull farmers in Kenya. Photo courtesy of Holly Enowski. “They hear about the deaths, but they don’t connect that they are because what the people and animals are eating,” Enowski said. The interviews in Enowski’s report, which she will give at the World Food Prize’s Global Youth Institute in October, centered on the gender perceptions of aflatoxins. For her report, she interviewed 20 small-scale farmers in Kenya and 20 in Uganda. She found out that asked about if there was equal awareness between men and women, each group said its respective gender was more aware of aflatoxins, Enowski said. Farmers in Kenya and Uganda practice what is known as the push-pull agriculture method, fending off insect pests (stemborers), a parasitic weed (Striga) and poor soil fertility. The practice, used by millions of small-scale farmers in sub-Saharan Africa, works by raising a pest-repellent intercrop plant in between the rows of cereal crops. Farmers usually plant silverleaf desmodium, which pushes the stemborers away. Farmers then plant an attractive trap plant, such as Napier grass, around the border of the intercrop. The stemberors lay their eggs in the trap plant, where insect development ceases. Furthermore, the desmodium plant stimulates suicidal germination of the Striga. During the research and report writing processes, Enowksi and her fellow intern, Mirti, have been mentored by Charles Midega, a senior research scientist in ICIPE’s push-pull program, and Zeyaur Khan, the push-pull program director at ICIPE. Khan has spent the last 20-plus years assisting the development of the push-pull method in Africa. Holly Enowski takes a selfie with some of the 83 fifth graders whom she taught English to this past summer. Photo courtesy of Holly Enowski. 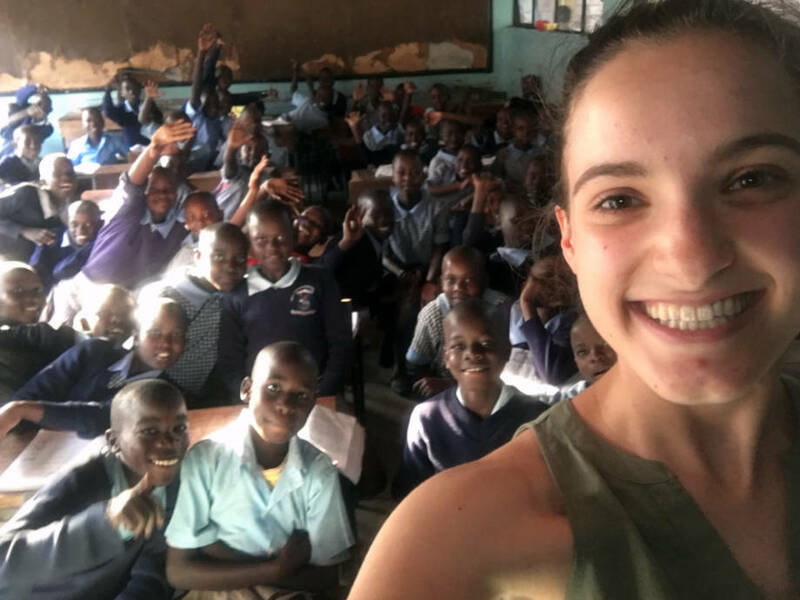 In addition to her 9-to-5 internship, Enowski kept an ICIPE intern tradition: teaching a class to the students at the nearby Mbita Point International Primary School from 5-6 p.m. each day. Even though she taught English to the 83 fifth graders in the late afternoon, they proved to be alert and voracious learners. “They were good. They were better behaved than any class I’ve ever been in,” Enowski said. On her last day, the school dismissed the students early, around noon. Most of the students stayed with Enowski, though, out on the dirt in front of the school to soak in a few more English lessons. Although Enowski spent plenty of time visiting and talking with farmers, she and Mirti went on a few excursions — including a visit to the paternal grandmother of U.S. President Barack Obama, Sarah Onyango Obama. Enowski recalled all of the security measures taken before and ahead of their visit to her house. Holly Enowski sits with Sarah Obama, the grandmother of U.S. President Barack Obama. To the left of … Expand ▸Holly Enowski sits with Sarah Obama, the grandmother of U.S. President Barack Obama. To the left of her is her fellow intern, Isaac Mirti. Photo courtesy of Holly Enowski. “She said she didn’t like all of the attention. She said ‘I’m not him, so I don’t know why I need all of that,’” said Enowski, relaying back what Ms. Obama said through an interpreter. Although Ms. Obama did not speak English, Enowski spoke English with three of President Obama’s distant female cousins who were close to her age. The visit to “Mama Obama,” as she is sometimes affectionately known, came during the beginning of Enowski’s time in Kenya, where the two official languages are English and Kiswhaili. Enowski said it surprised her to learn how much Kenyans know about American pop culture and politics. Ms. Obama’s grandson, who last visited Kenya in July 2015, served as the catalyst to this realization. Among her interactions with push-pull farmers, Enowski met a farmer who went by the name “Mama Molly.” Molly ran an orphanage. Out of the corner of her eye, she saw a boy wearing a Mizzou sweatshirt while walking around with Molly. “I said ‘Oh, Mizzou!’ He didn’t know what I was saying. ‘I said I go to that school.’ I don’t think he knew it was a school, but it was funny,” Enowski said. 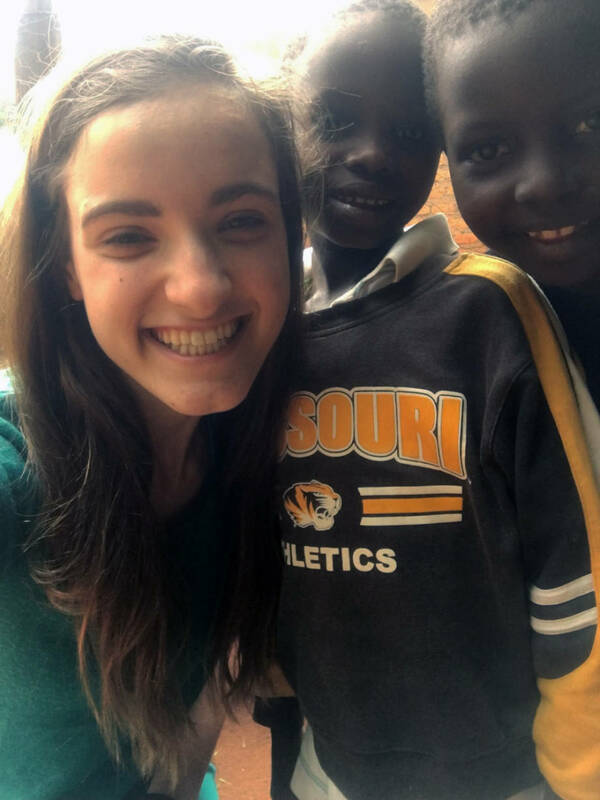 One of the children Holly Enowski met in Kenya was a boy named Clinton, who happened to be wearing a … Expand ▸One of the children Holly Enowski met in Kenya was a boy named Clinton, who happened to be wearing a Mizzou sweatshirt at the time. Photo courtesy of Holly Enowski. Clinton was just one of several children who were more than happy to take photos with Enowski. They were fascinated by her and her fellow visitors. Mbita, which sits on the massive Lake Victoria, has a population of close to 6,000. It is similar to the size of her hometown of Eldon, located near a much smaller lake: The Lake of the Ozarks. Enowski hopes to return to Kenya every two years or so. 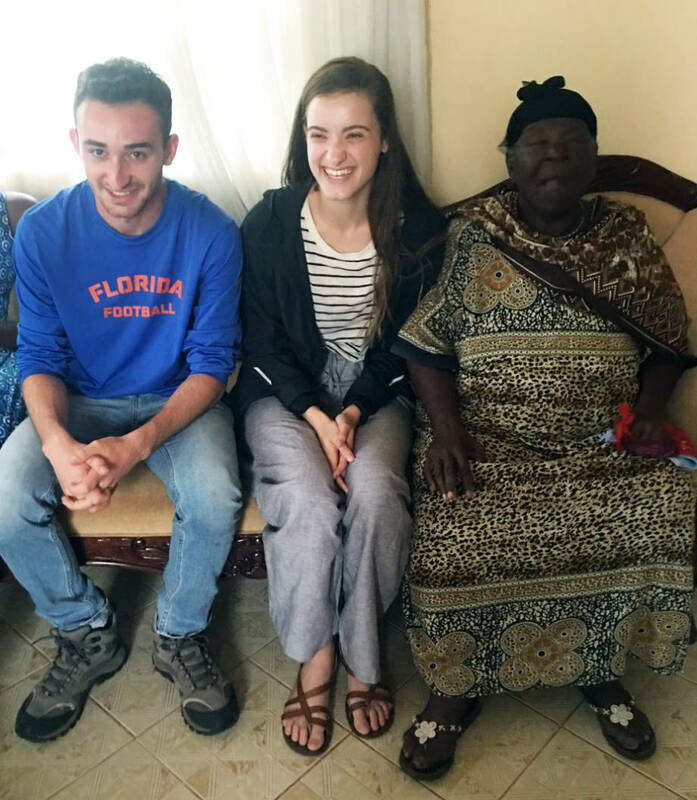 When she goes back, she wants to spend most of her time in Mbita, visiting with the folks at ICIPE and Matilda Ouma, the woman whom she called her “Kenyan mom.” Ouma helped guide her around and served as an interpreter when needed. To her, Mbita and its people represent the heartland and essence of the country. Nairobi, the capital and biggest city, is to Kenya what New York City or Los Angeles is to the United States. Although Enowski does not miss the noisy lake bugs that frequented the ICIPE complex, she misses her interactions with Ouma and the others she grew close to in Africa. “They were always open to our questions,” Enowski said. 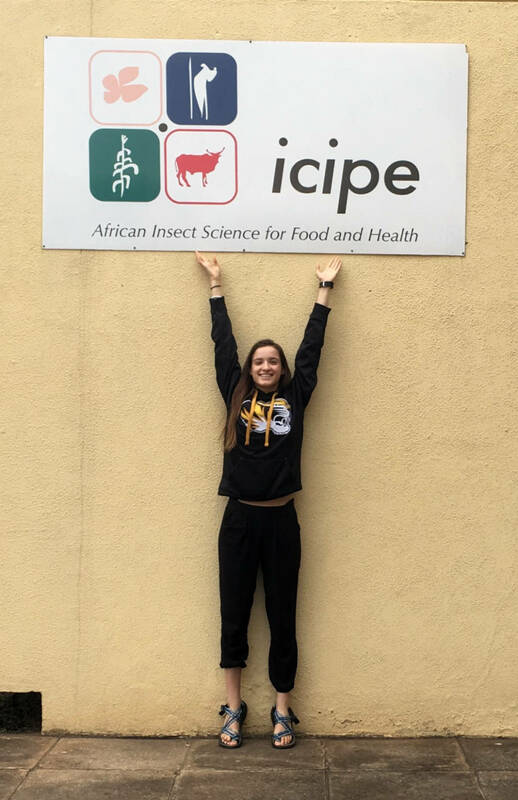 Holly Enowski stands underneath a sign at the ICIPE offices in Mbita, Kenya. Photo courtesy of Holly Enowski. Since leaving the slow-paced life of Africa, Enowski’s world has sped up again. 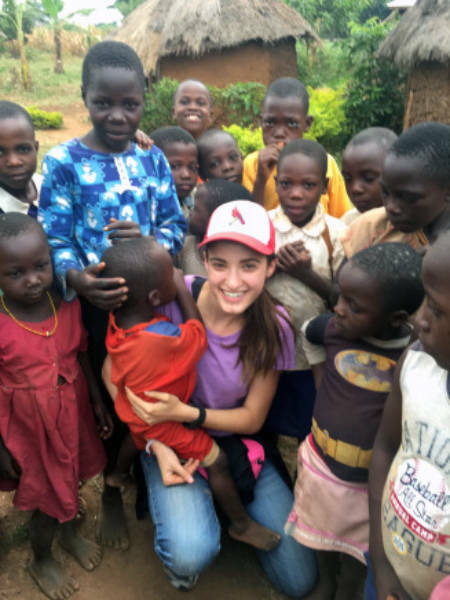 Between preparing for her freshman year and participating in sorority rush activities, she had not yet fully unpacked her suitcase two weeks after returning from Kenya. “I haven’t really had much time for reflection,” Enowski admitted, even though she started a blog to keep all of her family and friends connected to her experiences. The blog also helped provide content for a weekly article she submitted to her hometown newspaper, The Eldon Advertiser. Her journey began with attending the Global Youth Institute in 2014 on her own as a high school junior and then bumping into Willi Meyers, the director of CAFNR International Programs. That encounter led to the formation of the inaugural Missouri Youth Institute at MU, where Enowski shared her story and her interests with high school students. “She was one of our key leaders, not only among students, but among all of the adults as well,” said Michael Ouart, outreach and engagement coordinator for CAFNR, who oversaw the running of the first-time event. Enowski’s involvement included serving on the planning committee, recruiting several of the 35 students who attended and serving as the event’s emcee. Now as an ambassador of the Bourlaug-Ruan program, Enowski feels an even stronger sense of responsibility to motivate both high school students and fellow college students alike to be involved in the World Food Prize and its related institutes. She wants students to realize the role they can play when it comes to addressing the food production and supply challenges on a global scale. “The big thing for me is to help open the doors for other people,” she said. The top of Enowski’s blog reads “Do one thing every day that scares you.” Although Enowski said she felt some trepidation mixed in with a cluster of emotions after Fleming’s phone call back in April, the unique experiences and the people she met reaffirm her quick decision. If given the opportunity, she would say yes again — just as fast as the first time. For more information and photos from Holly Enowski’s Borlaug-Ruan International Internship, visit her blog at https://hollyjenowski.wordpress.com/. For additional information on the Missouri Youth Institute, read http://cafnrnews.com/2016/02/the-world-beyond-their-own/.